Designed in Australia by the King Living in-house design team, the Jasper has received a new exciting design update. The Jasper II celebrates quality craftsmanship and timelessness, adding style to any living room with its luxurious contemporary aesthetic and unique features. When your needs change, Jasper can change along with you. The arrangement of platforms, cushions and shelves can be easily moved around and rearranged to suit any occasion, whether you're relaxing at home, entertaining family and friends or accommodating overnight guests. 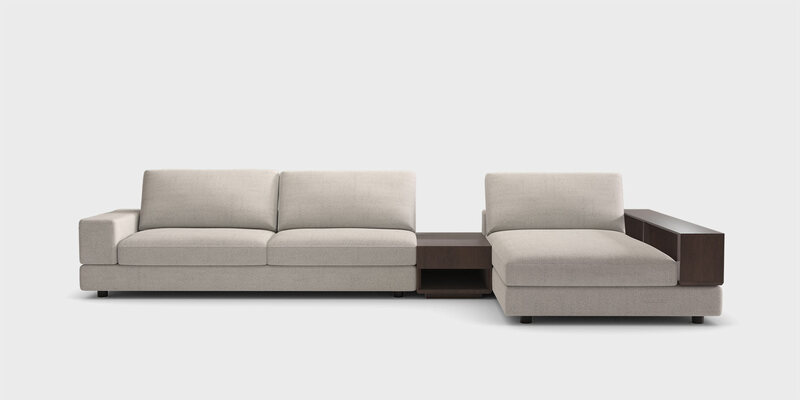 King Living is famous for its modular and storage sofa options that provide the ultimate in personal comfort and practicality. Jasper II features optional storage without compromising on design or comfort making it easy to store away items when they are not needed. Designed in Australia by the King Living in-house design team, Jasper graces the living room with its luxurious contemporary style and unique design features. Jasper's iconic feature are the flexible single-height and double-height timber shelves that can be easily moved into different positions on the Jasper platform to suit your needs. Available in a range of timber veneer finishes, Jasper II offers a new charging shelf feature to effortlessly re charge your mobile device effortlessly. Featuring new Smart Pockets™, you can now choose from a clever range of Smart Pocket™ accessories including an LED reading light, smart swivel tables, and a charging table that wirelessly recharges your mobile devices effortlessly. Discover King Living's exclusive and extensive range of high grade, quality fabrics and leathers.